The Castle of Bourdeilles stands on a rocky spur and it dominates the surroundings with its impressive octagonal keep. It was built in the early 14th century, probably on an earlier fortification that existed on the site since the 9th century. Because of its strategic position, the fortress was highly prized in its early days. During the Hundred Years War, there was much fighting for the castle and it changed hands several times from English to French. At the end of the war, possession was split between the Counts of Perigord and the King of France. This arrangement worked well until the 15th century when the Counts started robbing the nearby villages using the castle as a base. As a consequence, the King intervened and confiscated the castle. In the end, the Bourdeilles took again possession of the castle when Francois de Bourdeilles bought it back from the Count of Perigord. At the end of the 16th century, a Renaissance palace was built next to the castle. Much of the interior decoration has survived to the present day. 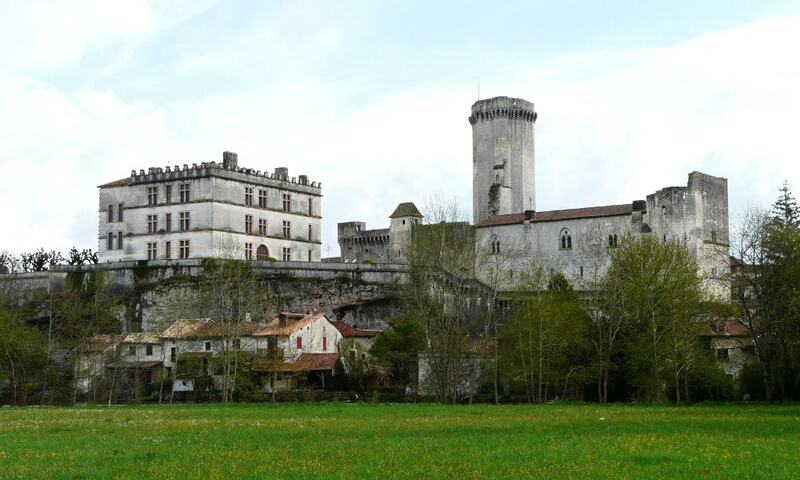 Descendants of the Bourdeilles family offered the castle to the Dordogne Departement in 1962. Today, the castle complex is opened to the public. It consists of the octagonal keep and outer walls that remained from the old castle and the 16th-century Renaissance palace. The palace has richly furnished interiors with beautiful painted ceilings and a prestigious collection of furniture. Next to the Renaissance Palace, there is a beautiful courtyard garden. Visitors can climb the keep and get splendid views of the village below.